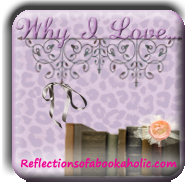 Weekly Meme, "Why I Love Wednesdays" is hosted by Alexis of Reflections of a Bookaholic . Each week she posts a Why I Love Topic that she answers. Check out Alexis' blog and join in the fun. I have two that are favorites. These are in no particular order. They are both sort of old school, but I really enjoyed them. The first one is French Silk, by Sandra Brown. My cousin recommended this book, and it jump started me on a year long binge of Sandra Brown. I really enjoyed her books. Then the newer books started to transform and they weren't really romance anymore, but instead suspense/mystery. Regardless. I'm so glad I got read to most of her books. They are all pretty good! My second pick is the Left Behind Series, by Tim LaHay and Jerry B Jenkins. These books were not only recommended, but I was gifted the full set by a coworker that I became good friends with. I never really read Christian fiction before, so I was skeptical, but these books are really good! You may be surprised, like I was. Great series, but the content can get pretty heavy after reading 13 books in a row. I didn’t complete the series, but I got through book 13 out of 16 before I needed a break. I will return to it and finish it eventually. The series begins with Left Behind, when the Rapture occurs, everyone who didn’t follow Christ was left behind, here on earth. It does refer to the bible and other christian values, but in an entertaining way. It doesn't have that "churchy" feel at all. The books are adventurous and unbelievable (in a good way). “Book Haul Tuesday” is my weekly post where I take a peek at the newly released fiction books of the week and post the books which I’ve added to my forever growing “To Be Read” list. I also post books that I've received and/or purchased from various sources. I hope to introduce you to some interesting books and talented authors that you haven't read yet. Hopefully I'll motivate you to run out and pick up a new release or two for your shelf or reader! It's short and sweet this week. Only one book added to my list! Wake, by Amanda Hocking (YA Urban Fantasy) - I just really enjoyed her last series, so naturally I have to see how this book is. Get the Kindle version of this new release here! My favorite books this summer were the latest installments of two different series. These are both paranormal romance series. They are face paced, action packed, romance packed, lusty and perfect for summer ready! If you haven't yet, you must check out J.R. Ward's Black Dagger Brotherhood Series, and Lara Adrian's Midnight Breed Series. I adore them both. They are both about a group of vampire protecting the world, but the similarities pretty much end there. They guys in these books are very different. J.R. Ward's brothers are more rough and tough and seem to have an hard edge to them plus some pretty scary villains. Lara Adrian's breed males are also tough and have equally tough villains to fight, yet the series seems a little more mainstream. What I mean by that is the series is a little softer, for lack of a better word. What's your favorite summer reading?